We have books for Nina in all three languages that she’s growing up with. So far, Nicolas and I stick to OPOL (One Parent One Language) quite religiously, which also applies to the book reading time. It means that when I read a book with Nina I read in Chinese, and when Nicolas reads a book with Nina he reads in French. So here is the dilemma. When we read a book that’s not written in ‘our language’ basically what we do is speaking ‘our language’ (by live translating or simply improvising) while looking at the written language of the book. 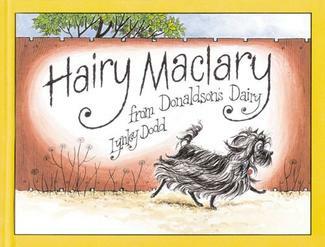 One of Nina’s favorite books at the moment is ‘Hairy MacLary from Donaldson’s Dairy’, a picture book in English about the little hairy black dog Maclary going out and about running into other dogs. It’s a beautiful book both in drawing and in text. The text rhymes, but of course it rhymes in English only! So when I read – meaning Speaking by half translating half improvising the story in Chinese – the rhyme is totally gone! While it serves the purpose – from linguistic point of view – on providing Chinese language input in this case, it loses the beauty of its original language (in English in this case). So I wonder if there are times, such as reading books, when it’s better to just follow the language that the book is written in? I shared my dilemma with ‘Raising Multilingual Children’ group on facebook, and got some fantastic insights from the members there! It’s relieving to read that I am certainly not the only person with the dilemma – there are many others out there facing the similar challenge and come up with their own solution with trials and errors. A more popular practice through these comments is to eventually read the book in the language that the book is written in. However there is one practice that I particularly like, which is to make sure at least certain amount of time every day (20 minutes in that case) to read the ‘minority language’ books. I like this practice because: 1) it ensures the quantity of the exposure of the minority language (in reading/speaking/hearing) on regular basis; 2) it respects all the languages that the books are written in, hence ensures the quality of exposure of all languages by helping the children to build the connection between the written form and the spoken form of these languages. So I decided to give a try this morning – not live translating non-Chinese books into Chinese, and read only Chinese books in Chinese. Nina picked up one of her favorite French books (Tchoupi Part En Vacances), and came sitting next to me signaling me to read the book to her. I have read this book many times with her in Chinese, but this time I started to read … in FRENCH! After I read the first phrase or so, I saw Nina literally turning her head from the book to me, looking at me … puzzled/surprised. Did she realize that I was not using the ‘normal’ language? Did she notice something different? Was she saying ‘why are you reading this book like papa’? It’s absolutely fascinating to see how much a child at her age (merely 21 months, who has only less than 2 dozens of vocabularies) is aware of what’s going on around her, from linguistic perspective. She knows what mama is talking about in which language, and picks up immediately when mama starts to do things differently. They are exquisite observers, which make them the most exquisite learners. Now what’s left to do is to make sure we build a good collection of books in Chinese and French (the more difficult ones being in Australia), and read English books in English. These are a few books I’ve read/found so far. Will continue to update the list as and when I found more. Some are directly linked to bi/multi-lingual subject, some are indrectly so. 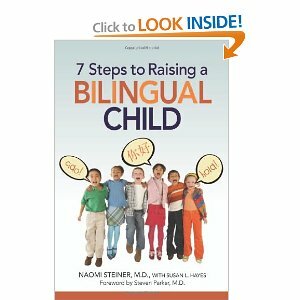 A Parents’ and Teachers’ Guide to Bilingualism. by Colin Baker. This is a ‘dummy for’ type of book. The author claims there are just 7 steps to follow, although I personally would rather take some useful tips out of all these steps, instead of necessarily actually following the steps. And also, this is a very US-centred book with lots of reference and discussion that is US only, so at times I feel slightly left out. 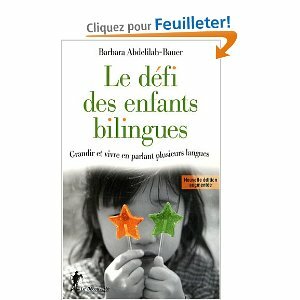 Le Defi des Enfants Bilingues – Grandir et vivre en parlant plusieurs langues. by Barbara Abdelilah-Bauer. I haven’t actually read the book yet, so will reserve my comments to a later time. 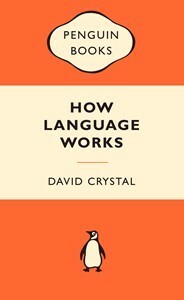 So it’s an interesting read on languages itself. 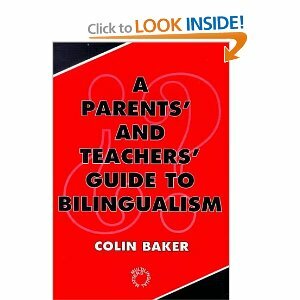 It does have a chapter on ‘Multilingualism’ that discusses how multilingualism works and how we cope with many languages. It also makes you reflect on how any human being – not just a child but as an adult – cope with more than one languages, as we do often these days. In a bilingual couple, you tend to stick to the language you used when you first met. At least, this is the theory I have to explain why between Nicolas and I French continues to be our daily language, although I think English would have been a more fair ground, and probably makes more sense now that we live in Aussieland, an English speaking country. We met in France, at a time when I had lived in the country for about two years and my spoken French really picked up after working for a local French company for almost 6 months. Our first interaction was in a French-speaking party, and we naturally went on conversation in French afterwards as well – although he did impress me with his Chinese particularly during a karaoke soiree in one of our first hang-outs. As I said, my spoken French picked up, but at the time it was far from fluent. One of my first and best French friends I met outside of school and work, Thierry, still recalls that during our phone conversation at the beginning he really struggled to understand me and make me understood. The feeling was mutual, monsieur ! But I sort of hanged on to it, thanks to my friends as well as a few of my VERY patient colleagues at the time, who at times had to slow down, repeat, and explain what I didn’t understand and tried to find the correct words/expression for what they guessed what I wanted to say. Thank goodness, we never switched to English as a result of frustration. Neither did Nicolas and I switch to English. During the first two years when our relationship blossomed, my French did too. Not only was I working in a French speaking environment, but also I was woven into this vast and day-to-day French social environment. I had to meet Nicolas’ friends, his parents and family, get introduced to social events, and understand French way of being in a relationship. I had no choice (I chose to have no choice …) and sometimes struggled to grasp the subtlety and the ‘non-dit’s, but fortunately I enjoyed most of time. So French became part of our relationship, even when we moved to Shanghai. Nicolas’ Chinese improved by taking more lessons and living there simply. We had talks about using more Chinese between us for the sake of his Chinese practice, however we somehow never managed to do so. We would start a conversation in Chinese, then slowly French or English words would creep in, until almost always French took over. It’s a bit like any routine – once you establish one, it becomes really difficult to change it. The pattern continues after we moved to Sydney. Both of us speak fluent English and that’s the language we use for work and most of the social activities. However in our private world, French rules. Of course we throw in words/expressions from other languages that we both associate to in regularly basis. In a French sentence, we would use some English or Chinese vocabulary, and for the sake of fun pronounce them with deliberately strong French accent, or vise versa. We enjoy the game. Our daily language is quite a mix-and-match indeed. Now that we’re going to raise a trilingual child, we probably need to be more conscious about the mix-and-match of our language so that it doesn’t unnecessarily confuse the child (or would it?). We both want her to be a REAL Chinese, French, and English speaker, and from what I read so far (I will be sharing my learning in this blog), it takes more than a laissez-faire approach, so the linguistic dynamics in the family is going to change I sense. That will be a whole new discussion. For now and in the forseeable future, between Nicolas and I, francais will continue to rule.